Another Beautiful Day in Paradise. Our day started out at 57 degrees with clear skies and a little breeze out of the SW. The weather warmed up nicely during the skate/bicycle. Absentees Dee, Carol J, John L, Ginnie & Rick, Diane & Bill and Roy came. Welcome all. We thought about doing the neighborhoods but decided to head South to Park Blvd. and back after we did Taylor Park. Our round trip was about 10.4 miles. We had 3 skaters and 8 bicyclists. John L renewed his Sponsorship. Thanks John for the web site support. We Brunched at the Savory restaurant as planned. We got in an out within an hour. Service was pretty good and the food great. Rob and Jeff both rated their Brunches a 9.8. Tyler undated the web site and it now goes through 26 May 2013. 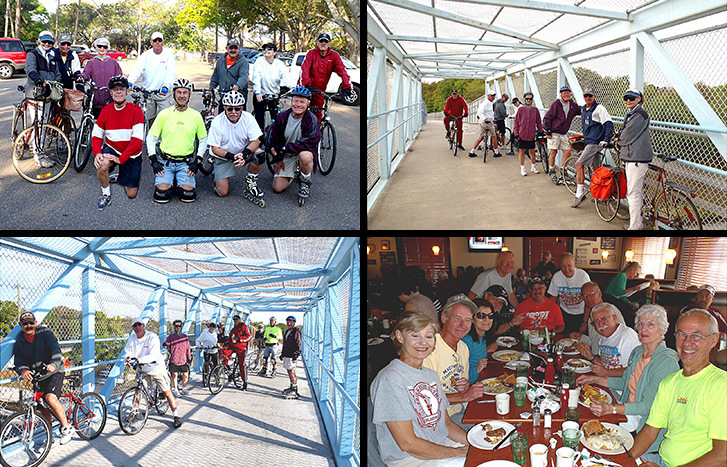 We have two new skate/bicycles coming up before long: The Skyway Trail and The Legacy Trail.